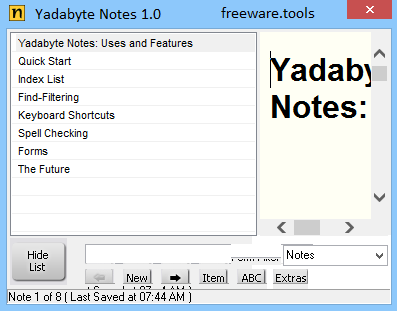 Yadabyte Notes is a small software application whose purpose is to help you take notes and store the information into a single HTML file so you can easily carry it with you. Plus, saving data to HTML file format brings you the advantage of opening the file via your preferred web browser (e.g. Firefox, Opera, Chrome) or other third-party text editors. In other words, all notes will be kept in a single file (html) that you can keep using and carry for ever. This file can be opened in any web browser, text editor or word processor. Every note records its history, so you need never loose information, even if you clear the note. No installation is required to use this tool. This is a portable program which can be stored on USB flash drives or other devices. No settings files are left on the host computer. They are actually saved on the storage device. In order to access the tool’s GUI, you only need to run the executable file because the installation process is bypassed. Plus, you may run the utility without administrative privileges. Yadabyte Notes sports a simple interface that keeps track of all your notes. With a single click on the target note, you can easily read its content directly the main window. In addition, you are allowed to show or hide the list with notes. You can assign a name to each note, type in the content of the note directly in the main window or paste it from the clipboard, go to the next or previous note in the list, insert bullets, and highlight data. The note information is automatically backed up to HTML file format, and you may also manually save data from time to time, clear the current note, keep note history, perform searches, and arrange the notes in the list by dragging them up or down. A few configuration settings help you show the last created, last modified, new, current, or first note at startup, set the font size, automatically run the utility at Widows startup, as well as tweak Google Calendar synchronization options. You can also employ preset hotkeys for faster actions, carry out spell checking tasks in order to make sure your text is error-free, and make use of form templates (HTML pages with the form defined on it) in order to store information about contacts, car statistics, book collection, and other details. Tests have shown that Yadabyte Notes carries out a task quickly. It is not a resource hog so you can keep it running in the background without worrying that it eats up CPU and memory resources. To sum things up, Yadabyte Notes delivers a straightforward software solution for helping you store multiple notes, and can be configured by rookies and professionals alike.